« Our new lighthouse bagger! Through all of my travelling around the country visiting lighthouse, there was one in particular that I’d yet to reach and was standing out like a sore thumb on the mapping software I use to keep track of which I have been to and those I haven’t. This lighthouse sits on the end of the pier in Folkestone harbour. The closest I had come to seeing this one was my final stop at Dungeness on my lighthouse tour and also a trip over to Dover to see South Foreland and those around the Kent coast. Somehow it had been left out on both occasions and, not being a place I’d regularly go anywhere near, I wasn’t sure when I would get the opportunity to see it. Fortunately, during a visit to the Isle of Wight in January, we had a morning to spare before we had to head north, so we made a bit of a detour during our trip from Gatwick Airport to Lancaster – by, of course, heading in completely the wrong direction. Luckily, getting to Folkestone from Gatwick is very straightforward so we had no issues finding the pier – we’d also planned ahead and printed maps which helped. 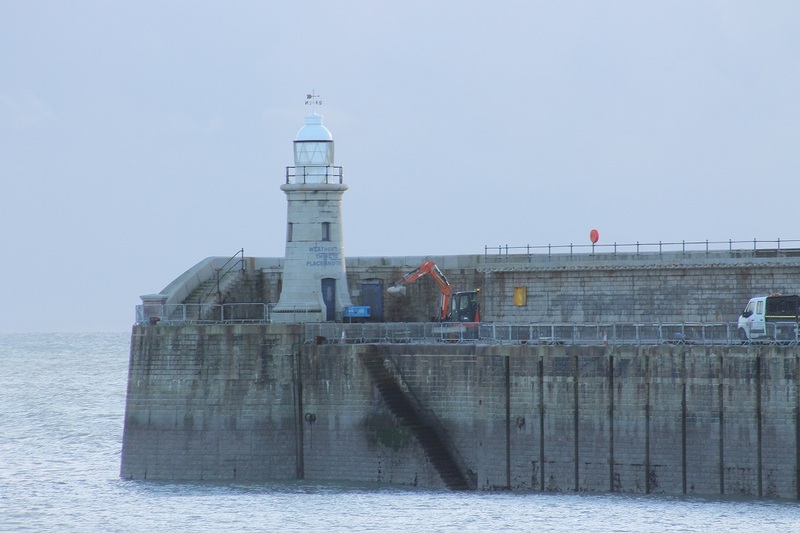 The pier itself is currently closed to the public (a Kent Online article from last July may explain why it is currently not accessible), so we were not able to approach the lighthouse itself and had to settle for a view of it from the entrance to the pier. It’s quite an attractive structure with a weather vane sitting on top and the words ‘Weather is a Third to Place and Time’ painted in blue on the side of the tower. At the time we didn’t pay much attention to this, but having done some research into why these words appear on the lighthouse, I’ve found out that they were part of a piece written by Ian Hamilton Finlay, an artist/poet who died in 2006. According to the Folkestone Triennial website, where there is more information, these words are “a practical reminder of how important the weather is to all who work at sea. It also suggests how the weather – onto which we tend to project our moods – colours in and gives meaning to the two dimensions of our normal self-awareness: place and time.” It’s nice to see an added dimension to a lighthouse visit – even if you don’t really notice it at the time. It would be nice to visit again some time, although I’ve mentioned before that it’s taken me a few years to finally get there! After we’d left Folkestone we headed for Lancaster, our stop for the night. The following morning we were racing against the weather, which was due to turn bad throughout the day so we were keen to reach Ayrshire (where Bob’s parents live) at a reasonable time. However, it was of great importance that we did a little “tidying up” in the area before leaving Lancaster. 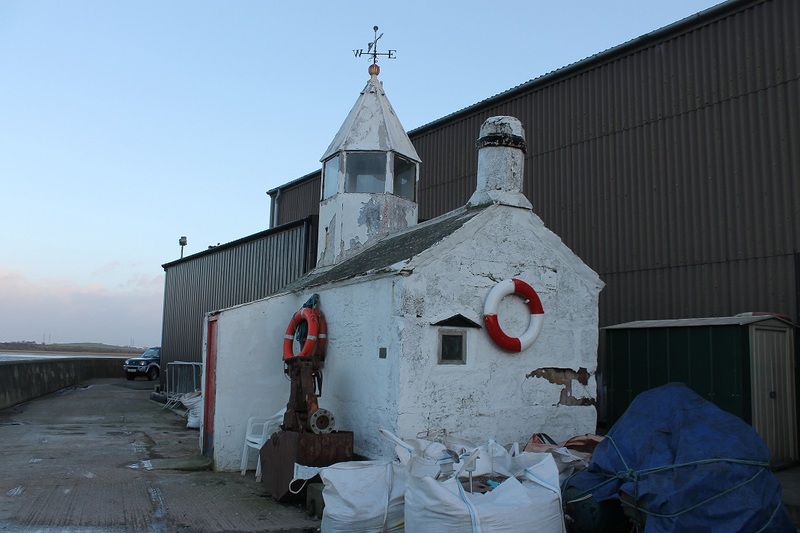 On my original tour back in 2012 I’d attempted to visit the lighthouse at Glasson Dock, but had been unsuccessful, mainly due to it being a weekend and access being restricted. Having Bob (and more detailed maps) with me this time, I thought we probably stood a better chance of finding it and it turned out it wasn’t so difficult. It was second time lucky with this one and we were able to get a good view of it. In its day it may have been quite a nice little building with a prominent position, but now it is completely overshadowed by a huge building and is looking very derelict and forgotten. You will see from the picture above that it’s not a typical lighthouse and we were very intrigued by its history, so I set about trying to find out something about it while we headed north. There’s not a lot of information available, but from the Panoramio website I was able to find out that it was built in the late 18th century and registered as a grade II listed building in 1985. It’s such a shame that it’s now been left to serve very little – if any – purpose and is unlikely to attract any interest now that it is surrounded by such huge buildings, which I believe were built and are owned by Glasson Fertilizers. Not sure why Panoramio is saying its “not the best lighthouse in the world” I think its pretty cool but then I love the quirky ones! I think its beauty is even accentuated by the ugliness of its surroundings. I agree! It’s got lots of personality. Just a shame it’s overshadowed now.